In January of 1500, Pope Alexander VI has recently subjugated Candar and Ramazan, two Turkish territories bordering the Black Sea and the Mediterranean respectively. The Papal State’s holdings had expanded to include much of Tuscany, Romagnan lands up to an including Ferrara, and Northern Napoli. 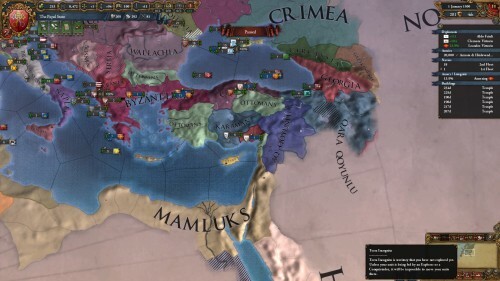 The great bulk of this and previous Popes’ military and diplomatic efforts had been exerted primarily towards limiting and later eliminating the Ottoman juggernaut in the near East, establishing local vassals to peacefully administer the Orthodox Christians and Sunni Muslims native to those lands. The Mamluks are a serious regional power, Wallachia is poised to pounce on Ottoman Bulgaria. 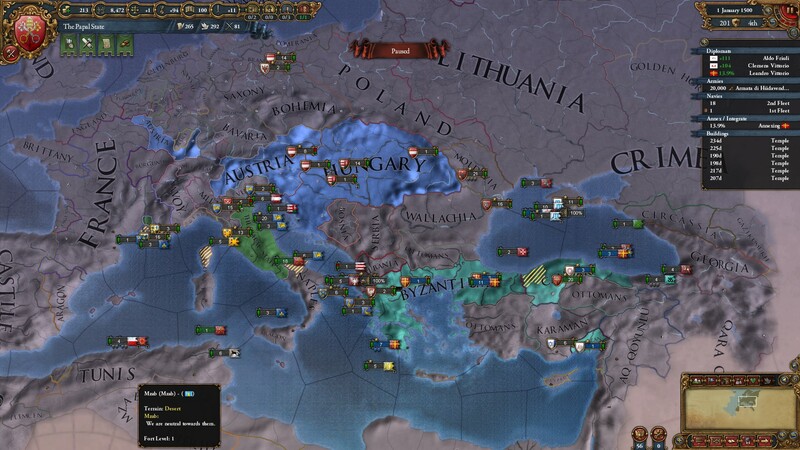 Serbia is losing a war that will force them to spit out Ragusa, a thorn in their side that will become a serious problem in due time. 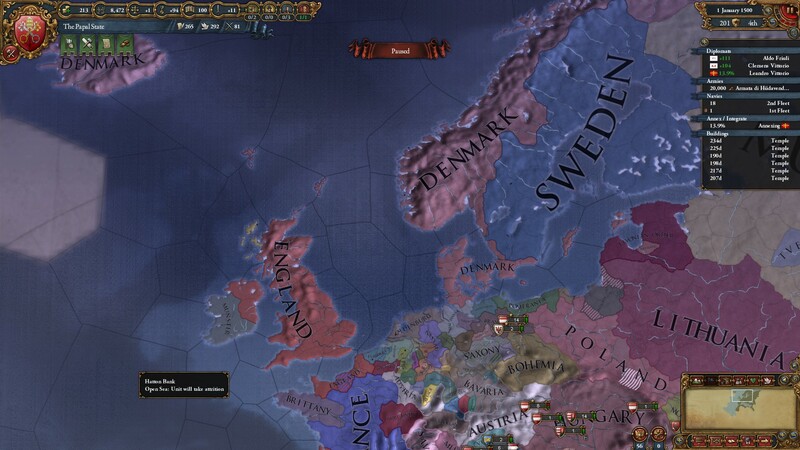 Looking North, we see that Denmark has incorporated Norway into its realm and annexed Riga. England has Scotland on the ropes, and has split the island of Ireland with Munster. Oldenburg and Nassau has acquitted themselves well, taking over Frisia and Münster. 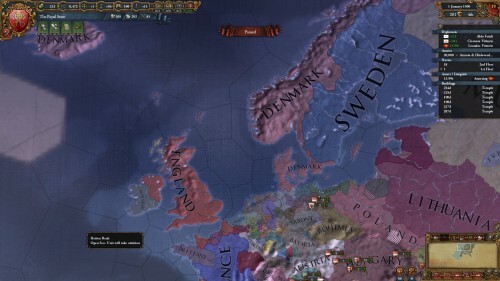 The Teutonic Order is in a pretty sorry state and not likely to maintain independence after its current war with Poland. The middle of the Holy Roman Empire is, as usual, an unqualified mess. In Western Europe we see a familiar division between Portugal and Castile, with France having taken Catalonia from Aragon, and England maintaining multiple toeholds in the continent. Their war with France isn’t looking good at the moment, but the English lion will remain in Acquitaine and Normandy for some time to come. Austria has expanded its holdings from Sundgau up toward the Low Countries. What could possibly go wrong there? 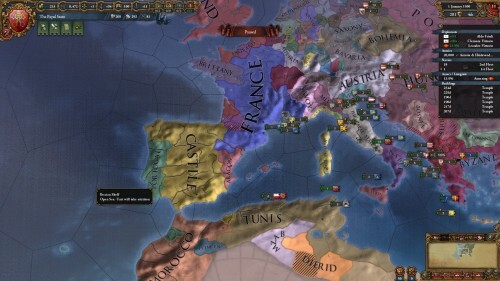 Brittany is not only still independent, but has taken Anjou and Maine from Provence. 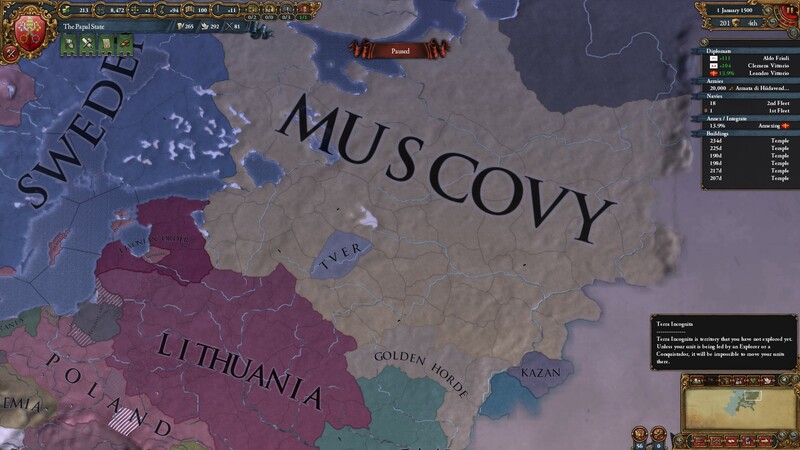 To the Eastern extent of Alexander’s knowledge, Muscovy has run Novgorod into the ground and should be forming Russia in short order. 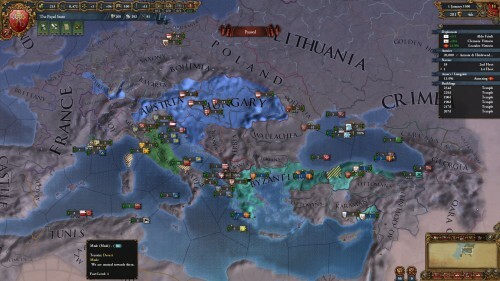 Poland and Lithuania have been in a personal union for a while now, and will soon integrate into the Commonwealth, a proper superpower with the greatest manpower resources in the world, eclipsing even Ming China.